LED diode, yellow, ф10mm, 1560mcd, 20mA, 60°, convex, diffiuse, THT Yellow LED diode with diameter 10 mm, diffused yellow body, wavelength 590 nm, brightness 1560 mcd and angle of light 60°. 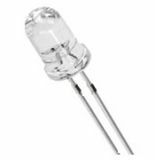 LED diode, red, ф5x8.7mm, 7000~9000mcd, 30mA, 15°, convex, transparent, THT Red LED diode with dimensions 5x8.7 mm, transparent housing, wavelength 620-630 nm, brightness 7000~9000 mcd and maximum direct current 30 mA. LED diode, yellow, ф5x8.7mm, 9000mcd, 30mA, 15°, convex, transparent, THT Yellow LED diode with overall dimensions 5x8.7 mm, transparent housing, wavelength 585-595 nm, brightness 9000 mcd and maximum direct current 30 mA. LED diode, red, 10x14mm, 6000mcd, 30mA, 30°, convex, transparent, THT Red LED diode with overall dimensions 10x14 mm, transparent housing, wavelength 620-630 nm, brightness 6000 mD and maximum direct current 30 mA. 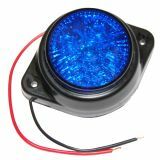 LED diode, blue, 5800mcd, 16mA, 10x14mm, 30°, convex, transparent, THT Blue LED diode with overall dimensions 10x14 mm, transparent housing, wavelength 465-475 nm, brightness 5800 mD and maximum direct current 16 mA. 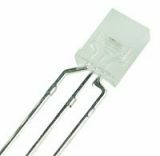 LED diode, SMD3528, 3500К, 1800-2300mcd, 120° LED diode. White colour. List Price 0.40лв. VAT Incl. 0.36лв. VAT Incl. 0.32лв. VAT Incl. 0.28лв. VAT Incl. 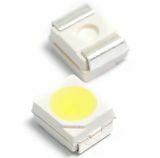 LED OSY5RU5A31A-5V, Ф5mm, yellow, 585-595nm, 1120–1560mcd, 20mA LED diode Ф5mm, with transparent body, wavelength 585-595 nm, intensity 1120-1560 mcd, maximum forward current 20 mA. LED infrared diode with blue corpus, Ф5 X 8.6 mm LED Infrared diode with blue corpus, Ф5 X 8.6 mm. High reliability, high radiant intensity,low forward voltage, Pb (lead) free. LED diode 20 mA red LED diode, red. LED diode SMD3528, 180mW, warm white, 2600-3200K, 130 ° LED diode SMD3528, 180mW, warm white, 2600-3200K, 130 °. 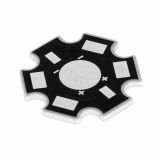 LED heatsink base plate ф20mm LED heatsink plate 1 W.
LED, green, 525 nm, 2500-3000 mcd LED WW-GND50TC-Q1, green with wavelength of 525 nm and intensity of 2500-3000 mcd. List Price 0.20лв. VAT Incl. 0.19лв. VAT Incl. 0.18лв. VAT Incl. 0.17лв. VAT Incl. List Price 0.70лв. VAT Incl. 0.66лв. VAT Incl. LED diode, yellow, 590 nm, 600-1200mcd Yellow LED diode with wavelength of 590 nm and brightness between 600 - 1200 mcd. 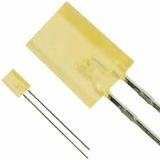 LED diode VQA34, 2x5 mm, rectangular, yellow, diffused Yellow diffused rectangular LED with size 2.5x5 mm. Price 0.03лв. VAT Incl. 0.03лв. VAT Incl. 0.02лв. VAT Incl. 0.02лв. VAT Incl. List Price 0.10лв. VAT Incl. 0.09лв. VAT Incl. 0.08лв. VAT Incl. 0.06лв. VAT Incl. LED diode, rectangular, 2x5 mm, two-color (red-green), diffused Two-color LED diffuse, rectangular with dimensions of 2 x 5 mm, with red and green light.